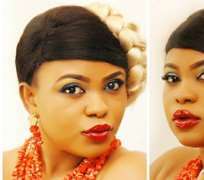 Nollywood actress, Sapphire Obi, is leaving no stone unturned as she struggles in the buzzing movie industry to make a name for herself. Now popular with her comic character, the actress is gradually getting a strong call up from producers who seems to be enjoying the weight she throws in to deliver her comic roles. She has always said that she is not in any competition with anybody as she is gradually stepping into the shoes of the likes of Racheal Okonkwo and others. No stress as the actress is gradually reaping the fruit of her labour as she releases some photos showing her transition as the day goes by.